The Open 5 Series is a series of Adventure Races held over the winter each year. The objective is to visit (navigate/find) as many checkpoints as you can in five hours. Some checkpoints can only be visited on foot (using a 1:25000 map), some on mountain bike (using a 1:50000). I have been doing these events since 2011 and absolutely love them. These take top priority race wise in my diary each winter and I have traveled the length and breadth of the country to take part (Somerset to Scotland anyway). One thing these events do well is take you ‘just’ off the beaten track: places you wouldn’t necessarily visit and after a five hour foray you get a good sense of the place you are racing in. I enjoy the personal challenge of keeping moving at pace for 5 hours (if you are late back, you incur penalty point deductions) and the fun in navigating over two different map scales. This event, the first of the 2016/2017 season containing 4 events was bound for a place I know well. 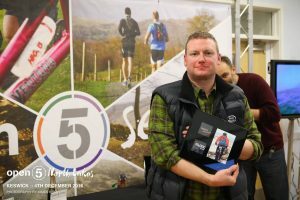 The North Lakes area around Threlkeld promised great mountain biking and some challenging navigation depending on which side of the road (A66) the organisers took us. 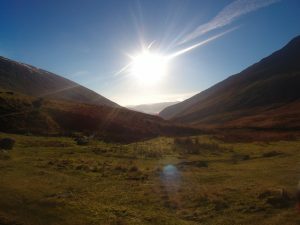 In the end it was north – around the foot of Skiddaw and the Skiddaw Forest for the biking and south, essentially an exploration of St. John’s in the Vale, for the run stage. I headed up the night before, to sleep in the van as I anticipated parking in Threlkeld to be a challenge for a hundred or so teams! Now at this point its worth noting that all the gear I use is well tested and trusted, including the bike, having been out on it locally the week before, I knew all I needed to do was lube the chain from when I cleaned it after that trip out. 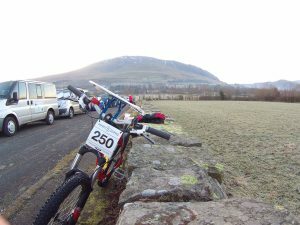 The morning of the race arrived and I got registered and organised and ready for the ride to the Start/Transition/Finish line, which on this occasion was a 20 minute/4km ride away (by Keswick climbing Wall). I set off and as usual I began to shift up and down the gears on my bike to get it all sorted and make any last minute adjustments to…. hmmm, no gears. I shifted the lever a few more times (on the rear mech)- nothing, then a sudden jump to the next cog. I tried the front derailleur – yes! All three. So that gives me 6 gears… ish. I kept shifting… nothing. This could be a long day! Feeling utterly deflated, I tried to tighten the cable using the adjustment wheel by the gear trigger lever, this seemed to make no difference. Now, up till this point I had never had a mechanical issue on these events, not even a puncture, so I began to hatch a b-plan of a shortened bike section and longer time on the run. I usually split the five hours as two hours run followed by three on the bike (there are more points available on the bike). This time I had already planned to try biking first, and I decided I would stick with that and see how I got on. I set off at 9.30 and as luck would have it bumped in to a fellow competitor I knew at the first CP on what I planned to be a clockwise tackling of the course, he – Steve and other competitor Andy, having asked if they had any suggestions relating to knackered gearing helped me do as much adjusting as possible whilst I was the bike rack. Having tightened up everything we could, with still no joy, Steve suggested I head in to Keswick and see if there was a bike shop open (9.50 on a Sunday morning!) that could help. They wished me luck and I thanked them for stopping to help and I set off into Keswick to start finding a mechanic! This was going to be a frustrating race! Steve had suggested Whinlatter bikes, I was thinking Keswick Mountain Bikes, both are a minute apart so off I sped as best I could. KMB had signs of life (Whinlatter was all dark) and as I peered through the door a chap appeared to sweep the entrance area, I put on my best Bambi eyes and asked “could you help me, I am supposed to be racing now, but my bike has failed” and the chap – Adam – very kindly said yes, bring it round the side. So having started racing at 9.30, by 9.58 I was in KMB, with my bike in a stand and receiving some attention from the very helpful staff of KMB. The verdict was the cable was past its best and needed replacing, that not being an option now (time and money both short!) Adam offered to pull the cable as taut as he could to give me a limited range for the day. It worked! I set off throwing thank you’s behind me (card and tenner in the post) and started clicking to see what I had… about 10-12 gears (from 30!) All in the mid range, so “I can’t go super fast and I’m going to struggle up hills, but I think I can make this work” was the mantra. Right on with the plan and off to the next CP! It was hard work with the limited gearing and I did cut my plan short – essentially no outlying CPs from the main track and I made it round the course in a full three hours – I definitely could have got more CP’s in less time, but I wanted to have a good run and needed as close to two hours as I could get. Its about here that I should tell the group about my cold. I have a cold. Its on the slide, but its still there. It made it presence felt on the bike, with a seemingly non stop flow of snot which I attributed to the cold air (the whole day was sub zero conditions, largely frozen ground with ice patches), but the minute I set off on the run, I coughed… and coughed and my nose was streaming. 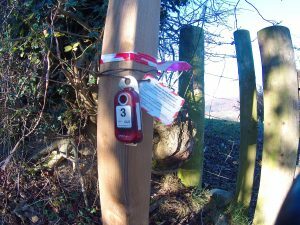 I started walking after the Castlerigg Circle, CP 21… and thought this event keeps getting worse! My head cold which I thought was on the wane, clearly was not waning enough, as I walked I studied the map and reigned my plan in, this was going to be a conservative day and despite almost perfect conditions (it was a bit slippy in places) I was going to have to be cautious not to push to hard and over extend myself, to then be late back and lose points from the meager total I had. I got back in the end utterly deflated despite the glorious day, I knew I had not done as well as I might. With 20 minutes left on my clock, I sat and considered what I may have done differently… On the positive side – at least I discovered the mechanical issue at the start and not half way through – when I was in the middle of nowhere and not near a shop! Also, although a head cold I have, as I write this it certainly seems to be better, barely 24 hours later. I think I dropped about 50-70 points with changed plans etc and definitely rode less – only 35km’s its usually over 50km for me and I ran only 8 km, I typically run 12-16km’s on these events. I scored 380 points, disappointing, but better than it could have been! Bring on the next one in February in the Yorkshire Dales! (Gutted there isn’t one in January this year). I was awarded my 10,000 points picture here. Open Adventure keep a tally of your Open 5 career points and commemorate them at 5,000 with a named number card and wee bottle of bubbly and at 10,000 points a framed picture of you on an event taken by James Kirby, (these are made available to all through Facebook after the race).